Reservoir Recall, and the FDA Gets Tough. This is an FYI post, in case you haven’t heard about it yet. If you’re a Medtronic pumper, you will hear about it because Medtronic is sending a letter and FAQ sheet to all their pump users. Medtronic Diabetes is voluntarily recalling specific lots of reservoirs for Paradigm insulin pumps. Apparently, the affected reservoirs are at increased risk for leaking. 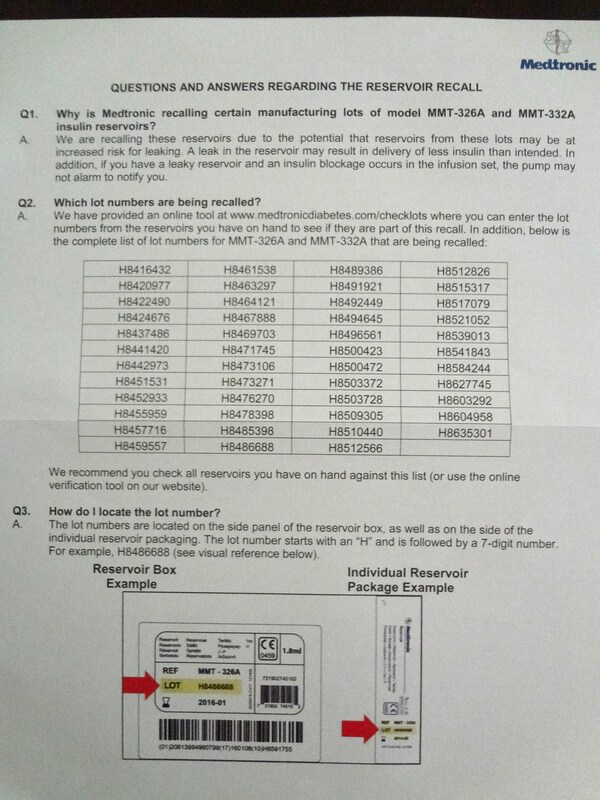 The photo above is part of the FAQ sheet I received that lists the lot numbers that are being recalled. – First of all, this is a voluntary recall. No one made Medtronic recall these reservoirs. I don’t know if there was any kind of communication between them and the FDA, for example, that led to the voluntary recall before a mandatory one. But still, a voluntary recall always happens faster than a mandatory one. – Medtronic conducted an investigation of the cause of this issue, and found that the reservoirs in question were all manufactured on a specific manufacturing tool that developed “abnormal wear”. They have corrected the issue and put additional testing and inspection in place. – Med-T has a number to call if you have the recalled reservoirs and need new ones right away: 1-866-450-0890. They will ship the new ones free of charge to you. Medtronic acknowledges a few cases of diabetic ketoacidosis requiring hospitalization that may have been caused by the faulty reservoirs. I don’t want to belittle these cases, or the patients and their loved ones involved. I also think it would have been nice if I’d have received an e-mail, or a tweet from @MDT_Diabetes. Other than that, what I am saying is that if a product I’m using does need to be recalled, I want the recall to be done like this. Also, the FDA has cracked down on companies selling products that claim to help mitigate, treat, or cure diabetes, but as we know, they don’t. This includes “natural” treatments that have undeclared ingredients; dietary supplements that claim to treat, cure, or prevent diabetes; homeopathic over-the-counter meds that claim to help with peripheral neuropathy; and prescription drugs sold by pharmacies without a prescription. – Diexi by Amrutam Life Care Pvt. Ltd., Surat India. – Anastasia Diapedic Foot & Leg Treatment by Anastasia Marie Laboratories Inc., Oklahoma City, Okla.
– Diaberex by Enhance Nutraceutical. – Zostrix Diabetic Foot Pain Relief Cream, Zostrix Diabetic Joint & Arthritis Pain Relief Cream and Diabeti-Derm Antifungal Cream, all from Health Care Products, Hi-Tech Pharmacal Co., Amityville, N.Y.
– Sugar Balancer by Health King Enterprises & Balanceuticals Group Inc., Chicago. – Insupro Forte by INS Bioscience Berhad, HLS International Sdn. Bhd., Easy Pha-max, Selangor Darul Ehsan, Malaysia. – Diabetic Neuropathy Foot Cream, Diabetic Foot Cream, and Diabetic Hand & Body Cream by The Magni Group, doing business as MagniLife, McKinney, Texas. – Eradicator by Naturecast Products, Coral Springs, Fla.
– Diabetes Daily Care by Nature’s Health Supply Inc., College Park, Md. – Glucocil by Neuliven Health, San Diego,Calif. – Neuragen PN and Neuragen Cream by Origin BioMed Inc., Halifax, Novia Scotia, Canada. 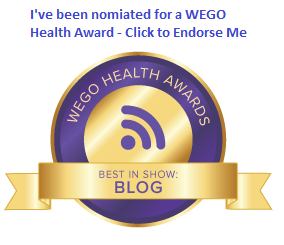 – Nepretin by Nutrient Synergy, Longmont, Colo.
– ProBeta by PharmaTerra Inc., Bellevue, Wash.
« #DBlogCheck – My writing. And more importantly, yours.